Highest quality 2-ply Mercerized Cotton is reinforced with durable nylon, and knit featuring the signature Florsheim Smooth Toe, hand-linked toe closure, to produce socks of a timeless tradition. The look and quality of these classic solid colors revisit the more refined times of the better men�s haberdasher. 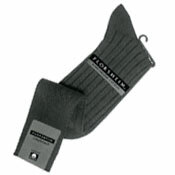 You will experience those days of quality and personal best when you wear Florsheim�s Comfortech socks. It takes a long and successful history for a brand name to define the character of the goods that carry its name. Built with the same dedication to quality, Florsheim socks are focused on the same defining features and a commitment of value, service and satisfaction to its customers.